Hunting spiders don't use webs. The so-called hunting or "chase" spider capture flies, lizards and frogs by accurately judging where to leap and jumping on top of them, even in mid-air. The attractive rainforest spider, Cupiennius salei, uses thousands of sensory hairs on the tarsi of its eight legs to detect prey or predator alike. It can also travel at an incredible 4m per second, faster than any tarantula. Blowflies (Calliphora) were used in a series of experiments by Christian Klopsch, Hendrik C. Kuhlmann, and Friedrich G. Barth in which they supplied air-flow patterns to test the spider's incredible sensory apparatus. They work in two Vienna universities and publish their research paper today: Airflow elicits a spider's jump towards airborne prey: I. Airflow around a flying blowfly in the Journal of the Royal Society Interface. Above: The apparatus that didn't produce valid airflows: measurement of the airflow above the spider legs with the fly positioned at various intervals along the grey scale. The horizontal laser sheet (green line; 2 mm waist thickness) just 'touched' the upper side of the tarsi (ca 2 mm above substrate). This fly was positioned 10cm above the spider and the airflow measured with the use of lasers. However it soon became obvious that the tethered fly provided less useful information than a free animal. For the more difficult free flying blowfly, measurements were much more worthwhile. They were different from the tethered fly and another experimentally-moved fly because air could flow around the prey animal. Apparatus was set up to allow a free fly to be measured in a Perspex box while the spider's reception of the flow could also be measured. There was a very strong circulation around the fly, directly causing stimulation of the tarsus of the spider's leg at a distance of 4cm. Then the fly flew directly above the leg and the turbulent flow of the wake affected the sensors twice as much as the initial stimulation. 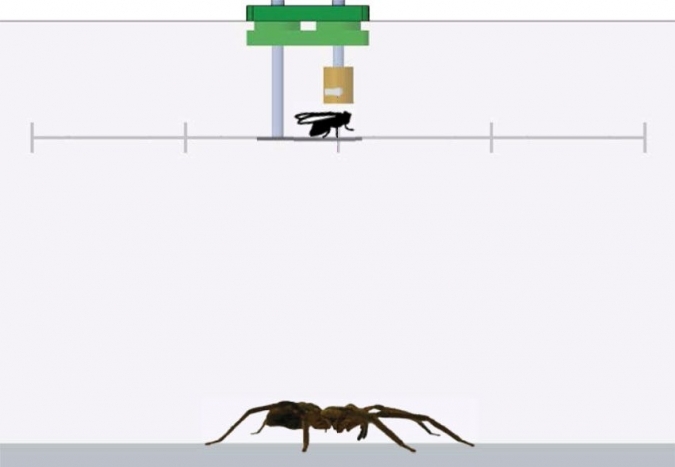 At 3cm behind the spider's leg, air flow was decreased, but in all three phases measured, a flow of air above 1mm per second allowed the spider to use its tarsal sensors. At 3.84cm, the spider detects the fly and with directional information incoming from all eight legs, Cupiennius is able to time its jump accurately in the dark and even when blind. It is evident that even the speed of the fly is estimated by the predator very closely. Now is the time that animals with external skeletons such as the Arthropods can be studied very closely, as our robotic and other devices become ever more sensitive. Our own sensors are based on skins that are sensitive throughout, but the hard bodied animals have to pack all of their senses in specialised organs, that we can copy directly onto robotic systems.